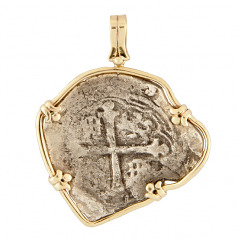 Spanish Silver Cob - Shipwreck San José - 4 Reales in hand made 14Kt yellow gold pendant. Obverse: Castles and Lions quartered by cross. Reverse: Hapsburg Shield, Mint and Assayer marks to left. The 700 ton galleon San José was cristened April 25, 1611. More than 30 years later, on May 31, 1631, the aging lady set forth from Callao, the port of Lima, Peru. 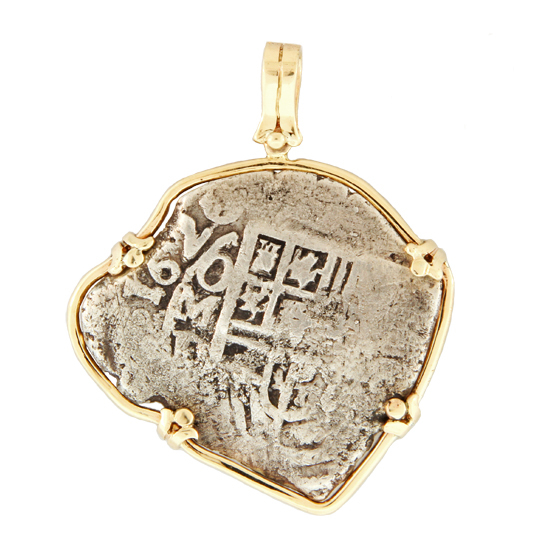 in her holds, she carried 1471 bars of silver, weighing nine tons,and 416 individual chests filled with reales de ocho- the silver coins known as "pieces of eight." Most of this silver had been mined from a virtual mountain of silver called Cerro Rico de Potosi, a territory of the Viceroyalty of Peru, which is modern day Bolivia. The San José, named for the patron saint of carpenters, immigrants, and the New World, sailed with a crew of 106 and at least that many passengers along with their personal wealth, including navigational instuments, weapons, tableware and ornaments, magnificent jewels, and of course money, in the form of gold and silver coins and bullion. With smuggling being such a widely practiced tradition, the San José also carried a substantial fortune in contraband wealth. The Armada was bound for Panama City, Panama, where precious cargo would be offloaded and transported overland to Portobello, for eventual shipment to Spain. On June 17,1631, near the end of this ill-fated voyage, on "a clear night with great currents," the San José hit a shoal in the Gulf of Panama. The First Pilot Captain Juan de Medina testified, ..." the ship struck bottom with the anchor beneath it. The anchor did not hold and the ship touched bottom several more times in such a manner that it was lost". Although immediate salvage efforts recovered some of the treasure, a great fourtune was left abandoned for more than four centuries. In 2013, Investigaciones Marinas del Istmo, S.A. (MDI), authorized by the Republic of Panama, began a legal recovery operation.